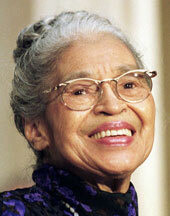 Rosa Parks was arrested for refusing to give up her bus seat to a white passenger. The year was 1955. The city was Montgomery, Alabama. She had no history of civil disobedience. It wasn’t a civil rights protest. She was tired after a long day of work. On that particular day, Rosa Parks decided that the status quo was just not right, and I was tired of it. Of the dozens or hundreds of brave civil rights pioneers who struggled in those early decades not only for black equality, but for the very idea of it, Rosa Parks remains dear to the hearts of millions of Americans. She showed in a direct, personal way how the politics of prejudice isn’t only class discrimination, as wrong as that is. Parks’ action dramatized how injustice strikes to the root existence of every American.